We all know our eyes from our elbows but what are the duodenum, the basal ganglia, and the islets of Langerhans? Could you locate any of them, let alone say how they make you tick? For an instant, edifying diagnosis of your amazing self, inside and out, simply digest these 50 easy-to-swallow topics.Anatomy gets straight to the heart of the matter: how your body operates. Whether you are a student … of medicine or biology, an artist, an athlete, or simply dying to know what your physician means when he mentions your plexus or your humerus, this is the quickest route to get under your own skin. Or, indeed, to understand exactly how your own skin works. 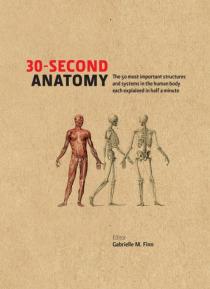 Dissecting the detail of everything from your bones to your brain into 30-second summaries, using no more than two pages, 300 words, and one picture, this is the hip way to understand the basic structures and systems that are you. Illustrated with gory graphics and supported by biographies of medical pioneers, timelines, and glossaries, it's the book of body parts that would have kept Burke and Hare in at nights.